Kansas City Sweet & Smoky Sauce. 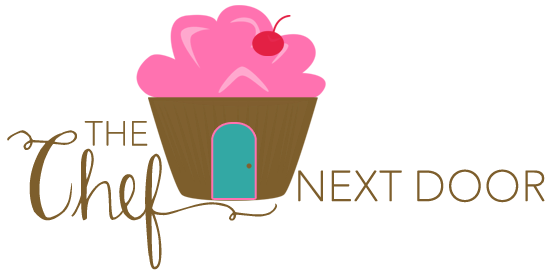 It's perfect for any Memorial Day or 4th of July cookout! Are you ready for grilling season? I know I am! In fact, I've already pulled out my grill and used it a few times this Spring. 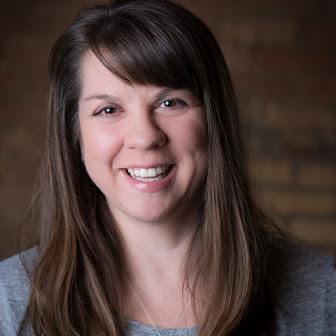 Now I'm dreaming of spending warm, sunny days on my deck, grilling up our favorite foods and having a get together with my friends and family. To me that's what summer is all about! One of my favorite meals to cook on the grill is burgers. I mean, that's just the traditional thing, am I right? I recently picked up some of the new Heinz BBQ flavors and decided I wanted to go all out for burger night. Get this, I made BBQ Bacon Cheeseburgers. 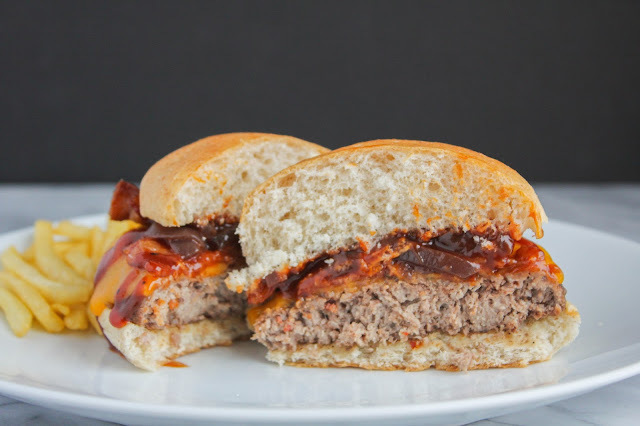 Using the new Heinz BBQ Kansas City Sweet & Smoky Sauce, I created the must luscious burger I've ever made. Seriously people, it's THAT good. My son said it was the best burger he's ever had! That was quite the compliment. I've always been a fan of Heinz BBQ sauce, especially because their sauces are 100% natural, but these new flavors have blown me away. The Kansas City sauce is a classic barbecue sauce with just the right amount of sweetness, spice and tang. It's thick and rich, too! It was created with input from the Regional Pitmasters of Kansas City, Joe & Mike Pearce of Slap’s BBQ. 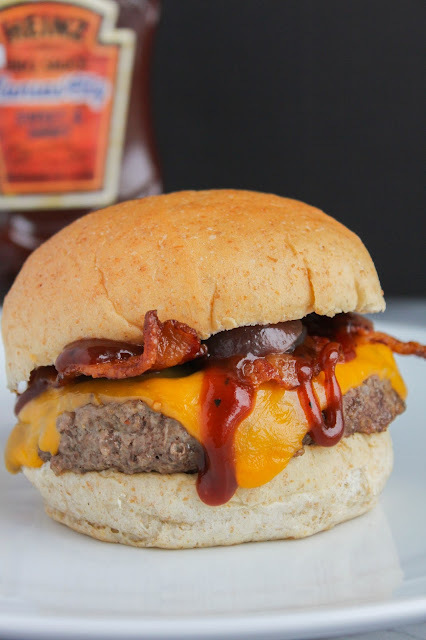 It's crazy delicious, and it was the perfect sauce to slather on my BBQ Bacon Cheeseburgers. This is one recipe that I'll be making a lot this summer. It's perfect for your Memorial Day or 4th of July celebrations, or just for your family on burger night. 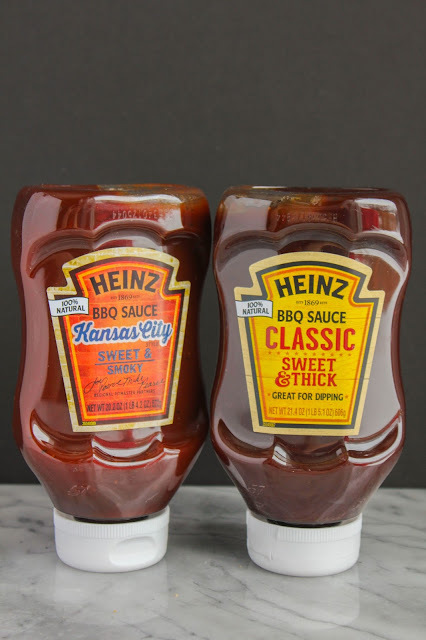 The other new Heinz BBQ sauces are Carolina Vinegar Style Tangy, Texas Style Bold and Spicy, and Memphis Sweet and Spicy. I found all four of the varieties at my local grocery store. 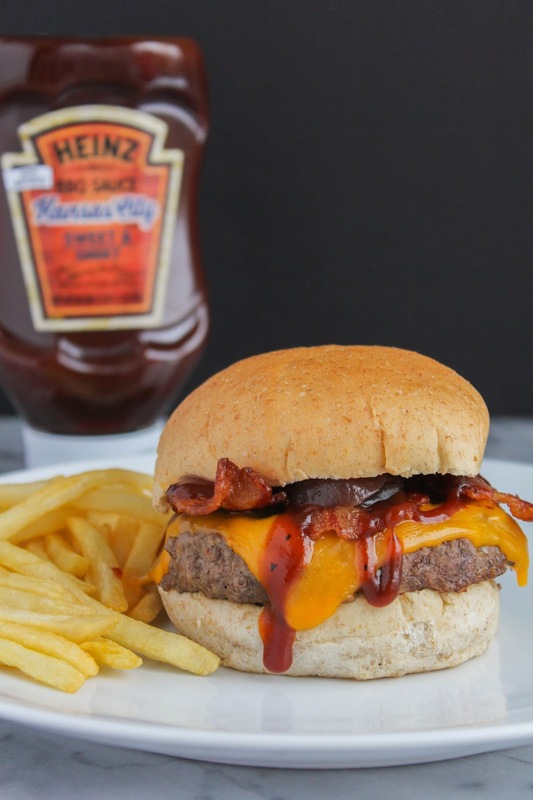 You can find more delicious Heinz BBQ Sauce recipes here! Are you hungry yet? I think it's time we grill some burgers! Preheat the grill to high. Pour the BBQ sauce into a small saucepan and warm it over low heat. Sprinkle both sides of the burgers with the burger seasoning. When the grill is ready, add the burgers and close the top. Cook for 5-6 minutes, then flip and cook another 5 minutes or so, until the burgers are cooked to your liking. Top the burgers with the cheese slices, then close the grill again to melt the cheese. Remove the burgers from the grill and let rest. Turn the grill to low and place the hamburger buns on, grilling for just a few minutes until warm. Place one burger on the bottom half of each bun. Add a heaping tablespoon of the caramelized onions followed by two slices of bacon, then a generous helping of the BBQ sauce. Add the top half of the bun and serve.